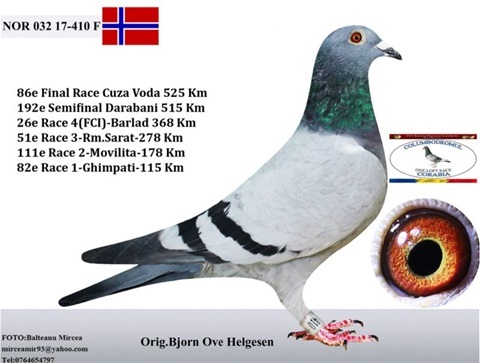 Our breeding pair 18 / 2019 is updated at our web page and consit two nice birds from Combination Beverdam. The sire is a Grandson "Chief" (2e NAT ACE BIRD SD WHZB 2007) in combination with the super breeder "Fiona" (mother of "COSMO" - 4e NAT ACE MD 2014 - and "LEONIDAS" - 1e ACE MD REG 2012. The hen is daughter “Cosmo” who won 4th NAT ACE Pigeon Middle Distance 2014.